Diamond Shape Number Sign - - personalized with the four digit house number you supply. Solid cast aluminum construction. Large 16.75"W x 7.5". Made in USA. Diamond rectangle number plaques are also suitable for interior use on office doors, professional suite doors, hotel room doors. This sign includes four 3" characters (including spaces). 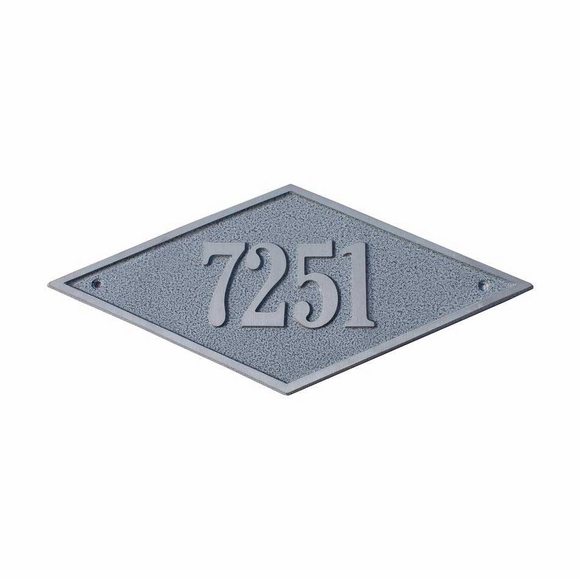 Solid cast aluminum construction in your choice of 16 plaque colors. Address and border are the aluminum. Dimensions: 16.75" x 7.5". Weighs 1.5 pounds in aluminum; 5.5 pounds in brass. Solid cast aluminum street number sign, office number sign, room number sign. Made in USA.